In this video, we’ll show you how to set up your Element, and start recording. 1. Download and install the Element Control software. 2. After your mac restarts, connect the Elements power supply. Connect your Element to your mac using a Thunderbolt cable. 3. Update the firmware if prompted. 4. Click Yes to use the Element as your mac’s I/O. 6. If the Element Control App doesn’t launch automatically, launch it from your applications folder. 7. Close any open windows. 8. Go to the window menu and select Essentials. 9. Turn the monitors all the way down. 10. Turn the Main output level in Essentials all the way up. 11. Play back a song from iTunes, and slowly raise the monitor level until the music coming out of your monitors is at the maximum volume you would ever listen to. 12. Back off the main output level in the essentials window until your at a comfortable listening level. 13. If the audio sounds distorted, open the Primary window and select -10dBV in the Main Output Level menu. 14. Close the Primary window and set the Main output level to a comfortable listening level. 15. Stop playback of audio and close any apps you have open beside Element Control. 16. Before setting up your input, turn down the Main Output all the way. This will prevent feedback when using microphones. 17. Connect your input source to your Element. The 1/4 inch jack can only accept input from instruments. So if you’re using a mic, make sure to use an XLR cable. 18. 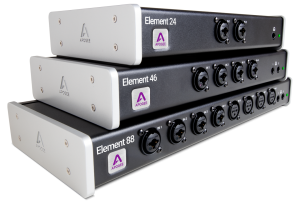 Select the input type-Mic, Instrument, or a line level setting +4dBu or -10dBV. These are used for sending a signal from another audio device. If your mic needs phantom power, engage the 48V button on the input you’re using. For basic recording, you will not need any the other buttons in the Essentials window, but if you’re curious, select Hover Help from the window menu and read about each button as you hover your pointer over them. Keep in mind that you shouldn’t be hearing your input yet. We’re going to set proper input levels first. 19. Perform on your instrument or mic as you normally would, and raise the input gain until the signal in the meter is about 3/4 of the way up. If you see the orange over light, lower the gain. 20. Launch Ableton Live and create a new Live Set or open an existing one. 21. Go to the Preferences and select Audio and confirm the audio input and output device are both set for Element. 22. For low latency recording, set your buffer to 64. 23. Go to Input Config and enable the inputs you want to use. 24. Do the same for the output channels in Output Config. 25. Click the Create Menu or press Command-T to insert a new track. 26. Click the I/O button in Live and confirm your audio track is set for external in. 27. Select input 1 and set output for master. 28. Go to the audio track you just created and engage Input and Record Enable. 29. Put your headphones on. You can start with the headphone level at -40dB. Speak into your mic or play your instrument. You should hear yourself in the headphones. If the volume is too low, turn the headphone level up. We’ve already set up the input gain to a good level so it won’t clip or distort. So from this point on we should only adjust output levels when things are too quiet or too loud. 30. You are now ready to start recording.